Kang Kam-chan or Gang Gam-chan (948 – 1031) was a medieval Korean government official and military commander during the early Goryeo Dynasty (918-1392). He was a career scholar and government official, serving in a number of posts, including Prime Minister, and is best known for leading Goryeo's military to victory during the Third Goryeo-Khitan War, thus securing a long lasting peace with Goryeo's neighbors to the north. Gang was born in 948 into a prominent aristocratic family in the hyeon of Geumju (now Gwanak-gu in Seoul). His father was also worked for the king, Wang Geon, and had been awarded for helping establish a new dynasty and unifying the Korean Peninsula. A legend tells that on the day he was born a meteor fell toward his house, and an advisor to the king visited to find that a baby had just been born there, whom he predicted would become great and be long remembered. Gang Gam-chan's birth site is called Nakseongdae (site of the falling star, 낙성대,落星垈 ), near Seoul's Nakseongdae Station on the Line two subway. As a child, Gang was small for his age, but he showed signs of leadership and loyalty at an early age. At seven he began to learn Confucian philosophy, military tactics and martial arts from his father. After his father's death in 964, he left his household and traveled around the country. In 983 he received the top score in the civil service examination, and qualified as a government official at age thirty-six. In 992 he joined the royal court as a deputy under the Minister of Education. A series of tenth- and eleventh-century invasions of Korea's Goryeo Dynasty by the Khitan Liao Dynasty in Manchuria were repulsed in these Goryeo-Khitan Wars. The Khitans were an ethnic group that established the Liao Dynasty and dominated most of Manchuria (what is now northeast China) and part of inner Mongolia during the much of the tenth, eleventh, and twelfth centuries. As Liao grew, Goryeo had extensive conflicts with the Khitans over Goryeo's northern territory and the southern portion of Manchuria, which involved attempts to take the Korean people under Khitan control, until the Khitan invasions were finally repulsed and peace reigned. Following the fall of the Chinese Tang Dynasty's fall in 907 C.E., China experienced a long civil war. In 916, Khitan chief Yelü Abaoji, founded the Liao Dynasty. In 993, Khitan General Xiao Sunning invaded Goryeo on the Korean peninsula with an army recorded as 800,000 strong. Goryeo forces fought bloody battles and halted the advance before the Khitans reached the capital Kaesong. Opinion among the Goryeo court officials was divided whether to sue for peace or capitulate to the Khitan demands for territory and tribute. Gang Gam-chan was among those who supported negotiation. A hard line was communicated directly to General Xiao; Goryeo would yield neither land nor treasure, but agreed to break trade and relations with the new Chinese Song Dynasty. The Khitan withdrew back across the Yalu River with an agreement for friendly relations between Liao and Goryeo, having gained nothing substantial. In 1004 Liao defeated Song in the south and the Chinese emperor was forced to pay tribute. The only remaining challenge to Liao supremacy in the region was Goryeo. In 1009, General Gang Jo of Goryeo led a coup and assassinated King Mokjong; he set up the crown prince as king but also established military rule under his own power, and began trading again with Song. The Khitans used this as an excuse to invade again. In 1010 Emperor Shengzong of Liao personally led 400,000 Khitan fighters across the Yalu. After an intial loss, he easily defeated the Goryeo army under General Gang Jo and executed Gang when he refused to join Liao. News of this panicked the court at Kaesong, but Gang Gam-chan urged King Hyeonjong not to surrender and to flee southward from the burning capital. The Khitans failed to secure a Goryeo surrender and retreated; a Korean insurgency attacked Shengzong's forces relentlessly on their way back north, compelling him to withdraw. Continued tensions led to the further fighting. In 1018, Liao General Xiao Baiya led 100,000 men into Goryeo, meeting stiff Korean resistance at first but then breaking through and marching towards Kaesong. Again the Goryeo court responded nervously, and many officials urged the king to sue for peace, hoping to repeat the deal struck some three decades past. Gang Gam-chan, however, noting that the enemy contingent was much smaller than in previous invasions, advised the king to declare war. At the age of seventy-one he volunteered to serve as second-in-command of the army until the Khitans were forced out. He ended up leading 208,000 men toward the border; it was a numerically larger force than that of the Khitans but the Koreans were mostly on foot. The Liao were heavily mounted and enjoyed a clear advantage. The first battle of the war was the Battle of Heunghwajin, a significant victory: Goryeo dammed a stream and released it just as the Khitans were crossing. However, General Xiao did not give up hope of capturing the capital Kaeseong, and continued to march south. Later, Xiao realized it was impossible and decided to retreat. General Gang Gam-chan knew that the Khitan army would withdraw from the war, and awaited them at the fortress of Kwiju, where he encountered the retreating Khitans in 1019. Discouraged and starving, the Khitans were defeated by the Goryeo Army. Only General Xiao and few remaining survivors managed to escape from the devastating defeat. This battle is known as the Battle of Kwiju in Korea. General Xiao led a force of 100,000 men across the completed bridge onto Goryeo's frozen countryside in December of that year. Columns of Goryeo troops ambushed the Khitan from the moment they set foot on Goryeo territory. After breaking out of the ambush, the Khitan army drove southward, only to meet even stiffer resistance in the region around the capital of Kaesong. King Hyeonjong heard the news of invasion, and ordered his troops into battle against the Khitan invaders. General Gang Gam-chan, who did not have any military experience since he was a government official, became a commander of the Goryeo army of about 208,000 men (the Khitans still had advantages, even outnumbered two to one, since Khitan troops were mostly mounted while the Koreans were not), and marched toward Yalu River. Near the Garrison Settlement of Heunghwajin ran Samgyo stream. General Gang Gam-chan ordered it dammed until just before Khitans began to cross it, and when the Khitans were mid-way across the surge flooded the fording forces. Some 12,000 drowned or were killed by Gang's troops. The Khitans did not abandon their campaign, but they were harrassed by continuous and devastating attacks, forcing General Xiao to abandon all thoughts of conquest. He retreated safely back. Gang Gam-chan drove them northward into the well-defended Kusong Garrison near the northwestern town of Kwiju. There he conducted a massive attack that virtually wiped out the Khitan army; only a few thousand of the Liao troops escaped back across the Yalu. General Gang returned to the capital and was welcomed as the military hero who saved the kingdom. After the war, Gang retired from both the military and the government to rest, since he was too old, already having become a national hero. Four years later, the Goryeo and the Liao Dynasties established normal relations, and the Khitan never again invaded Goryeo. Gang was appointed as Prime Minister in 1030, one year before his death. He died in 1031. General Gang Gam-chan's overwhelming victories in the battles of Gwiju and Heunghwajin are often compared with the victories of General Eulji Mundeok at the Battle of Salsu or Admiral Yi Sun-sin at the battles of Hansan and Myeongnyang, which, like Gang's battles, overcame disadvantages and successfully defended the country. Along with them, Gang is regarded as one of the greatest Korean military commanders in Korean history even though he was not primarily a warrior as were Eulji and Yi. Following Gang Gam-chan's victories in the Third Goryeo-Khitan War peace settled in among the three powerful East-Asian empires, and both the Liao Dynasty and Goryeo rose to new cultural heights. Liao stopped trying to expand, and although Goryeo broke off official relations with Song Dynasty, they continued commercial trading with the Chinese. The peace lasted for about a century. The Jurchens took advantage of this time to expand their power without any interruption. However, as the balance of power on the Liao-Goryeo border shifted, the Jurchens, who lived around the border between the two nations, began to expand their power. Finally, in 1115, Jurchen chief Wányán Āgǔdǎ founded the Jin Dynasty in Manchuria, and began to attack both Khitans and Koreans. Within ten years Jurchen troops captured the Liao king, Goryeo ended up having to pay tribute to Jin, and the Jurchen drove the Chinese Song southward. The victories of General Gang marked the ending point of the chain of wars between countries and the beginning of a Goryeo-Liao-Song triangle diplomacy, setting the scene for the ascendancy of the Jurchens. A shrine to Gang Gam-chan, called "Anguksa," stands in at Park in Sadang-dong, Gwanak-gu, Seoul. An annual memorial festival is held at the shrine around October. Photos of the Anguksa Shrine and memorial statue of armored General Gang on horseback can be found at this Empas article, in Korean. Yi Wonik (1547-1634), whose pen name was Ori, tried to build a shrine to house the memorial tablets of Gang Gam-chan and Seo Gyeon at his home in Gyeonggi-do Province, but he died before accomplishing it. In 1658 wealthy landowners’ farmers of the region erected Samhyeonsa, a shrine dedicated to Yi Wonik as well as to General Gang and Seo Kyeon. Soon after King Sukjong assumed the crown, Samhyeonsa became a saaekseowon Confucian academy, and was renamed Chunghyeonseowon. The Hungguk Temple Pagoda was built in 1021 by Gang Gam-chan and placed in front of the Hungguk Temple southeast of Manwoldae, the ancient Goryeo royal palace in Kaesong, North Korea. The stone stupa now resides at Songgyungwan Academy in the northwest Kaesong suburbs. Three of its original five stories remain. A statue of Gang Gam-chan stands at the peak of Paldansan, which is one of the gates of the mostly still-standing seventeenth-century Suwon Hwaseong Fortress in Suwon, South Korea. The fortress is a popular tourist course in South Korea. A 3.2 km tourist train travels to Mt. Paldalsan and back from another gate along the long fortress wall fortress, Yeonmudae, near a commuter train station. 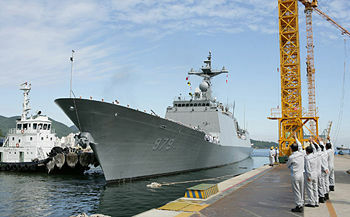 A KDX-2–class (4,500 tons) enhanced anti-air warfare (AAW) Korean naval destroyer was named after the famous general. The Gang Gam-chan Ham, No. 979, was built by Daewoo Shipbuilding and Marine Engineering’s shipyard on Geoje Island, Gyeongsangnam-do Province. Construction began July 2004; it was launched on March 16, 2006, and delivered October 1, 2007. ↑ In Korean, Khitan is Georan (거란, or 契丹 in Chinese characters). ↑ Cultural Heritage Aministration, Republic of Korea, website. See also the Chunghyeon Museum website Retrieved February 11, 2008. ↑ VNC Asia Travel, Utrecht, Germany Tours to North Korea may be difficult to arrange. Retrieved February 11, 2008. ↑ Korea Tourism Organization website Retrieved February 11, 2008. ↑ Maeil Business News, "Korean Warship 'Gang Gam-chan Ham' Delivered to ROK Navy," 2007 October 1. For higher resolution photo see Joongang Daily, October 2, 2007 Retrieved February 11, 2008.